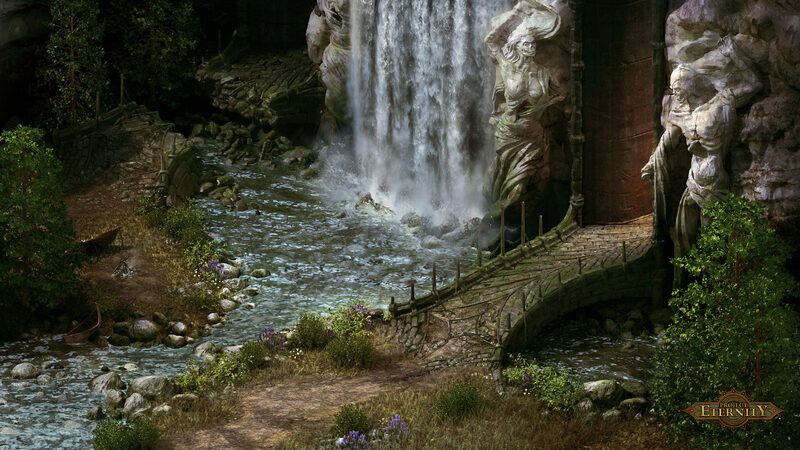 Pillars of Eternity is an isometric, party-based RPG set in a new fantasy world developed by Obsidian Entertainment. Pillars of Eternity aims to recapture the magic, imagination, depth, and nostalgia of classic RPGs that we enjoyed making - and playing. At Obsidian, we have the people responsible for many of those classic games and we want to bring those games back… and that’s why we’re here - we need your help to make it a reality! Pillars of Eternitywill take the central hero, memorable companions and the epic exploration of Baldur’s Gate, add in the fun, intense combat and dungeon diving of Icewind Dale, and tie it all together with the emotional writing and mature thematic exploration of Planescape: Torment. Não tenho uma grande opinião sobre o que poderá ser.. Tenho pena que nao seja outro Fallout mas pronto..
Cá espero o novo jogo. Obsidian's new game is Project Eternity, a Kickstarted fantasy RPG that pays homage to Planescape: Torment, Baldur's Gate and Icewind Dale. Game designers Chris Avellone (lead designer of Planescape: Torment), Tim Cain (creator of Fallout) and Josh Sawyer are helming the project. Project Eternity will have tactical real-time combat with a pause system. Positioning party members and coordinating attacks will be key to success. You'll create your own hero and collect companions along the way. It sounds like the hero you make will persist across "future adventures", providing this game gets funded and off the ground. The story will explore "mature themes" and present you with "complex, difficult choices". Obsidian needs $1.1 million to make the dream come true. For god's sake help them. Kickstarters Obsidians Project Eternity just hit the half-way mark (550k from 1.100k) in less than 6 hours! Acho que em menos de 1 semana já estará cumprido o objectivo. Com a gente que está envolvida no projecto bem que podem contar com o meu dinheiro. Project Eternity is now funded, $1.1M in 27 hours ! Vamos ver quanto conseguem até ao final do periodo. Ainda não me decidi pelo nível a escolher... Em princípio darei o máximo possível para a versão digital (os $35). Os portes de envio para os níveis com versão física que eles mencionam tornam o preço demasiado alto. E ainda por cima só lá para 2014 é que metemos mãos naquilo. Within even the recognizable races (including humans), we are creating a variety of ethnic subtypes and nationalities. This world's races did not all spring forth from the same place, and millennia of independent development have resulted in distinctive and unconnected groups. For example, the dwarf ranger below, is originally from a southern boreal region that is quite different from the temperate homes of her distant kin to the north. Obsidian Entertainment's upcoming crowdsourced isometric RPG Project Eternity is going to be DRM-free on GOG.com, the developer has announced. The Kickstarter update noted that backers who pledged at least $25 will be able to choose whether they'd like a key to the already announced Steam version or the DRM-free version on GOG. Obsidian is still working out a way to deliver the DRM-free version on Mac, as GOG only supports PC, but it's got awhile to figure it out as the game isn't due until spring 2014. Also new to the campaign are $50 and $80 digital tiers. The former nets backers a digital version of the game, soundtrack, digital Collector's Book, wallpapers, concept art, a map, and ringtones. The latter includes all that plus a digital copy of the strategy guide and another download key for the game. Elsewhere, Obsidian announced that backers can purchase an additional digital download of the game by pledging another $25, or get three more for $60. This is done by hitting the Manage Your Pledge button on the Kickstarter page where it shows the reward tier you previously selected with the amount written on top. Enter the dollar amount you'd like to add to acquire the add-ons. Finally, Obsidian decided to reward those who pledged $140 for the Collector's Edition Box Level with beta access to the game. The Kickstarter has currently surpassed its $1.1 million goal with $1,653,025 with another 27 days to go. Inicialmente tinha uma pledge de $35, mas lá acabei por subir para $50. A Obsidian é uma excelente companhia cheia de gente talentosa, mas os jogos que eles produzem vêm sempre cheios de bugs. A "desculpa" de sempre é que são pressionados para uma data de lançamento pelo publicador mesmo que o produto não esteja a 100%. Agora que não há publicador atrás vamos lá ver como se comporta a Obsidian, eh. Seja como for, com estas pessoas envolvidas, tenho enormes expectativas em relação ao universo e história deste jogo. Daqui a 1 ano e uns quantos meses lá veremos o que sai daqui. A imagem é promissora. Tiveram tão perto dos 4 milhões de dólares! De qualquer das formas os objectivos de 3 milhões (stronghold) e 3.5 milhões (outra grande cidade) são bem apetitosos. Parabéns à Obsidian e principalmente parabéns aos fãs de RPGs clássicos. Pode ser que com o sucesso dos kickstarters do Wasteland 2 e deste Project Eternity, as grandes empresas vejam que este tipo de jogos ainda têm um mercado considerável. Acho que eles ultrapassaram os 4 milhões juntando o que angariaram através do PayPal. Exacto, o valor actualmente ronda os $4,127,080, portanto todos os stretch goals foram atingidos e o Paypal ainda continua disponível para quem quiser. Agora é esperar cerca de 2 anos. Muito fixe o video. Com a tech de hoje, podem usar specular e normal maps à mesma em flat 2d pra dar volumetria dinamica à cena, assim como move/distort vector-based shaders pra simular o vento nos sprites de vegetação. A coisa mais impressionante do video é mesmo a água a subir e descer, interagindo com pre-rendered background. Pode ser feito através de masks e usando o alpha do normal map, mas o resultado é muito bom, nunca pensei que ficasse tão bem feito.